&Made @Pacific Plaza (Singapore) | Get Your Grub On! A friend told me about this place at Pacific Plaza which is a fusion of ‘L’Entrecote‘, the steak & fries place from Duxton and a modern burger joint with the concept created by Michelin Star Chef Bruno Menard. Half of the shop looks very similar to the french bistro using the same tablecloth and all and the other half looks like a modern style diner with an open concept directly in the mall. I ordered the ‘Lamb Burger‘ with ‘Truffle Fries‘. When the burger arrived it looked a bit small at first but turned out to be very sufficient and filling. Squeezing the burger into manageable size only very little juice dripped out which could have been a sign for very dry or very well hung meat, thankfully it was the latter. The meat actually was nice and chunky and still juicy inside, maybe a bit too soft for me but well seasoned and meaty in taste nevertheless. The bun was spiked with black sesame seeds, was soft enough but held up pretty good all the way. I was really looking forward to the combination of the mint sauce and the fresh cilantro which I absolutely love but they unfortunately were only hints in the total mix of flavors. In comparison to that the caramelized raisins and onions came out much stronger and dominant. The ‘Truffle Fries‘ were nice and crispy with a slight touch of truffle oil which didn’t come out too strong either but there was hardly any salt on them. This might have been just a personal preference of mine and was solved quickly by the friendly waiter bringing me a salt grinder. 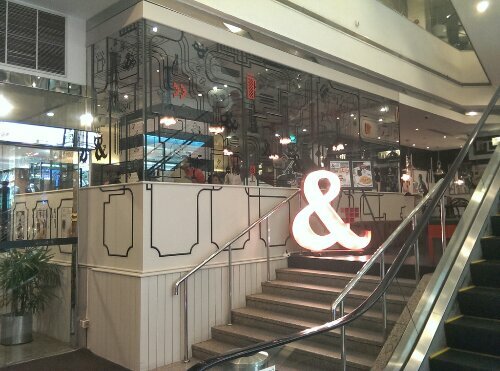 ‘&Made’ is a nice casual place with very friendly staff and most important decent burgers. However I will ask them for a double slap of mint and cilantro in case I should come back here next time which I’m not too sure about as it’s also not the cheapest of places with twenty five dollars ish a burger++. 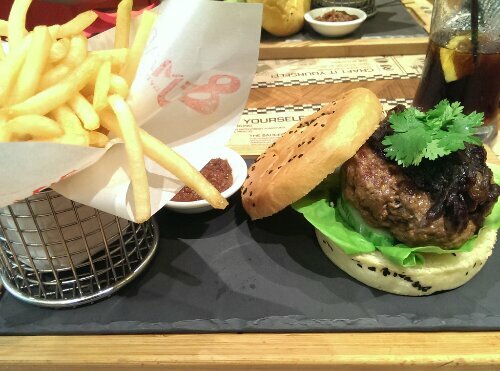 For steak & fries I probably stick with the Duxton branch as the atmosphere is just more bristro and less mall like.